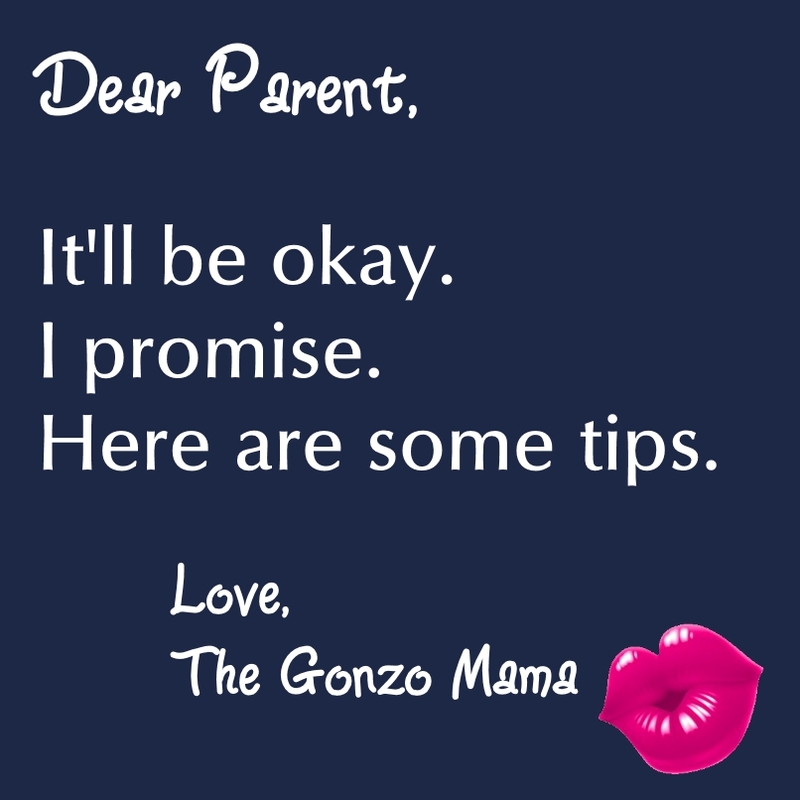 "Dear Parent, It'll be okay. I promise. Here are some tips. 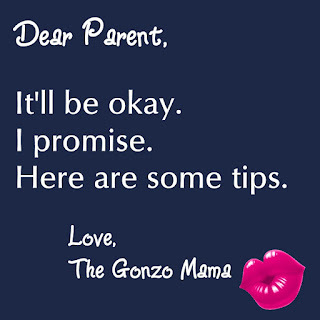 Love, The Gonzo Mama." Pink lips in the shape of a "kiss"
appear in the lower right corner. Hello, readers. I've recently been giving this topic a lot of thought, as I've been going through the diagnosis process with Bravo, and thinking about how different it feels, this time around. When Curlytop was diagnosed, it wasn't news to us, because we knew who she was, and she had been with us for over eight years. We'd been asking and asking for someone to please, see what we are seeing, and give this kid a diagnosis, so we could arm her with the empowering language and identity she would need, as she grows to adulthood. Self-identification ("I'm autistic") is such an important part of self-advocacy ("so I may need accommodation"), and we wanted to ensure she was equipped with that personal toolbox. And now, we have Bravo. Going through the diagnosis process was different, but just as important. Autism "looks different" in girls, you know? So, it's often easier to spot in boys, and the assessments and observations go more smoothly, and it's really just "yes, it's autism," or "no, it's not." In any event, we already knew Bravo was autistic, so the diagnosis was just a formality, just like in Curlytop's case. Even though I knew I was autistic, I wasn't diagnosed in childhood, so I had no idea what an "autistic childhood" should or would look like, when Curlytop was diagnosed. I just kind of muddled through childhood and adolescence as the weird girl who didn't understand relationships and friendships, who was always writing or had her nose in a book so she didn't have to talk to people, and had a really overwhelming obsession with numbers and counting things like the number of steps from English class to History class, the number of seconds it took to evacuate the building during fire drills, and the number of tiles in the Science room. I didn't have an autistic childhood. I had a really difficult, painful, tumultuous adolescence, and when I learned in adulthood that it was autism, it all made sense. It was freeing, liberating, and soothing. Everything I knew about myself fell into place. How much easier would it have been, had I been able to -- and encouraged to -- identify as autistic in my youth? A large part of me wants to believe I would have mastered self-advocacy much earlier, and I would have felt safer, more comfortable, and less like an outcast. Of course, I'll never know, but I want every autistic kid to have the opportunity to learn self-love, self-identity, and self-advocacy. Our job, as parents, is to provide those opportunities. When Curlytop was diagnosed, because I didn't have a model for autistic childhood, I was easily influenced by marketing, false-advocacy, and pressure from healthcare professionals. 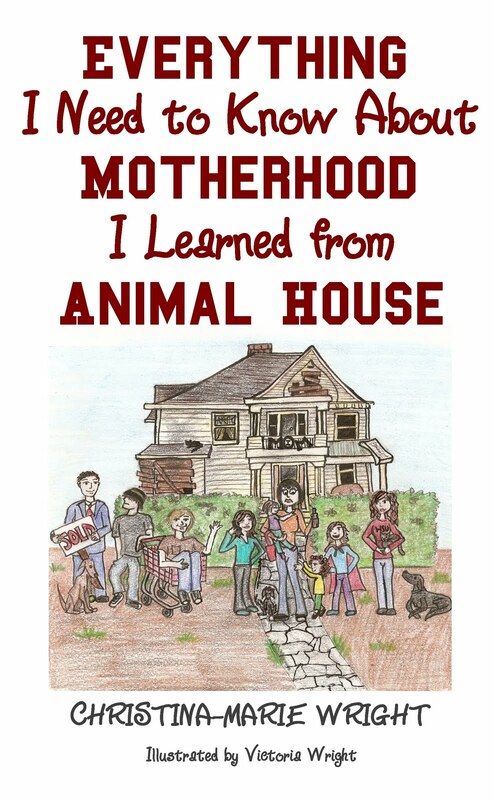 It took me a full year to gain stable footing as an independent parent and advocate for my child (and myself! ), and that footing actually didn't come from parenting communities or "Autism Awareness" campaigns or healthcare providers. It came from my growing network and community of autistic adults. What sort of future do I hope for, for my daughter, and the children in my care? I hope for one in which they are fierce, are proud of who they are, are in possession of strong and healthy boundaries, and ask for and receive help when they need it. So, it only makes sense to start setting that future up for them by learning from people who are already living it. 1. Your child's diagnosis does not change who they are, or who you are. You've known your child since birth (or -- for families created through adoption, kinship care, guardianship, or foster care -- since placement). You know who your child is. You've been together for a while, and your relationship is not changed by a medical proclamation. Your child is still your child, and your job is still to make your child feel safe, secured, loved, and protected in the world, while helping them to develop into the most beautifully awesome version of themselves they were meant to be. 2. You don't have to change anything, right this minute. Really. It's true. Your child was autistic yesterday, and they will be autistic tomorrow, and for the rest of their lives. Taking a little time to research, ask questions, and listen to your child and your heart will not doom them to failure. 3. You DO need to decide one thing, right NOW. Right now, before you do anything else, you need to decide what kind of parent you are going to be as your child grows to adulthood, and beyond. Are you going to be the kind of parent who shares things like, "You might be an autism parent if..." memes, without considering if they are offensive or harmful to your child and the autistic community? Are you going to be the kind of parent who compulsively "likes" and follows every single Facebook page or social media community that has "autism" in the name, without first learning what the page's or organization's views and positions are, and whether those positions are in opposition to the autistic community? Are you going to be the kind of parent who shares "inspiring" videos about how a football team helped an autistic kid make his first touchdown, without first asking yourself if the video exploits the autistic individual, for the sole purpose of spotlighting the non-disabled people, just to make them feel good/seem hero-like? Are you going to be the kind of parent who consents to and agrees to everything your child's healthcare provider suggests, without weighing the risks and benefits for your individual child? Are you going to be the kind of parent who is supports and embraces the notion that autism "stole" your child? Are you going to be the kind of parent who establishes healthy boundaries for your social media and real-life conversational sharing? Are you going to be the kind of parent who thoughtfully considers the values of a community, social media group, or fan page, and the impact of those values on autistics, before joining or following? Are you going to be the kind of parent who researches thoroughly every single so-called "advocacy" organization before supporting it, amplifying its messages, or using its symbols and slogans to show your advocacy for your child? Are you going to be the parent who embraces everything that your child is, and helps them to become confident in their identity? 4. Learn how to talk about autism, and work through your own misconceptions. Get comfortable with the language, and get uncomfortable when people use language that doesn't respect your child. This link has some really, really good information about five common language mistakes people make when talking about autistic children. It requires a download of a PDF, but I strongly suggest you not only download it, but also print it out for future use. Make copies to give to educators and service providers. The document is crafted by autistic voices, and when we talk about autism, those voices are the strongest -- and only -- authority on the subject. Much debate has been seen among my blog comments and social media comments about person-first language (PFL) versus identity-first language (IFL) when talking to and about autistics. Back when I was getting familiar with and comfortable with not only Curlytop's, but also my own, autism, I fell victim to the "PFL is always respectful, polite, and correct" dogma. However, after talking to actual autistics, I learned why a great majority of (but not all) autistics prefer IFL. 5. Decide, right now -- RIGHT THIS VERY MINUTE -- whether you are going to be an "autism parent," OR "the parent of an autistic child." It may seem like I'm trying to exaggerate what could be interpreted as a small issue of semantics, but the difference is huge. If you identify as an "autism parent," the emphasis -- the priority -- is on you, and your identity. When you're "the parent of autistic child," the emphasis -- and thus, the priority -- is on your child, and your child's identity. It's staggering how such a small difference in wording can create such a huge difference in advocacy positions, attitudes, and effectiveness. 6. Your child needs to see you advocate for them. Your child needs to see you fighting for them... so they learn they are worth fighting for. Your child needs to see you educating others about autism, autistic rights, acceptance, and inclusion... so they can learn to teach others the same. Your child needs to see you changing the world for them... so they can change it for others. PARENTS WHO HAVE AUTISTIC CHILDREN: What do YOU wish you had known, or done, when your child was diagnosed? PARENTS WHOSE CHILD WAS RECENTLY DIAGNOSED: What questions, as the parent of a newly-diagnosed child, do you have?